Who can you count on, if not your sister??? Join us for an evening of hilarious, intimate and moving family relationships! Redbud Productions is proud to present, for two weekends in October, Beth Henley’s Pulitzer Prize-winning comedy/drama of three eccentric sisters – Crimes of the Heart. The play, directed by local actor Tim Grimes, will feature award-winning actresses Cassie Mann, Loretta Grimes and Kyle Marie with a cast of accomplished area actors. The production will take place at Riverside Arts Center, located at 76 North Huron Street in Ypsilanti, for two weekends – Thursday through Saturday (October 9 -11 & 16-18) at 8:00 p.m., with 2:00 p.m. matinees on Sunday, October 12 & 19. Tickets are $16 for adults and $12 for youth and seniors and may be purchased at the door. Reservations may be made in advance by calling 734-663-7167. Crimes of the Heart won the 1980-81 Pulitzer Prize for Drama, as well as the New York Critics Circle Award. The all-star film version, which featured performances by Diane Keaton, Jessica Lange and Sam Shephard was nominated for several Academy Awards, including best actress for Sissy Spacek. The setting is Hazelhurst Mississippi, where a trio of disaster-prone, eccentric sisters have gathered. Each faces their own crisis. Lenny (Loretta Grimes), the oldest, is approaching spinsterhood and another lonely birthday with diminishing marital prospects. Meg (Cassie Mann), is returning to town after a failed singing career and a stint in a dog food factory and a mental institution. Younger sister Babe (Kyle Marie) is facing charges that she shot her well-to-do husband because she didn’t like his looks. When family emergencies bring the sisters together, they share troubles, open old wounds and bask in intimate family memories. The results are sometimes hilarious, sometimes painful, but always full of humanity. Redbud’s version co-stars Erica Dutton as Chick, the sister’s nagging and loud-mouthed cousin; Thom Johnson as Doc, the now somewhat crippled man that sister Meg left behind for her big city move, and Chris Starkey as Barnette, the awkward new lawyer set to defend Babe against charges of attempted murder. 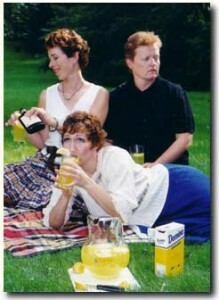 The production also features, in flashbacks, Sasha Lazare, Jenny Pritchett and Anika Steppe as younger versions of the three Magrath sisters in happier times. Director Tim Grimes trained at the American Academy of Dramatic Arts in New York and, with his wife Loretta, has taught Redbud acting classes for area youth and adults for several years, based on the methods of Sanford Meisner. He has performed in many local productions for Redbud Productions, MorrisCo Art Theater, Ann Arbor Civic Theater and other local groups, as well as in summer stock and regional production in New England. Using theater games, emotional recall techniques and character study sheets, each actor in this play studied the character they portray, and used events from their own lives to connect to the character’s emotions. The cast also used an intense series of improvisations, based on their character’s past lives, to more fully investigate the characters they portray. The result is a series of open, honest and compelling performances. This is a theatrical opportunity not to be missed!! To reserve tickets, or for more information, call Redbud Productions (734-663-7167).